I have told you that I have always been fascinated by world travel!As a boy, I remember telling my friends and family that I wanted to travel to the U.S.S.R and everyone just shaking their head. One of my favorite authors…. 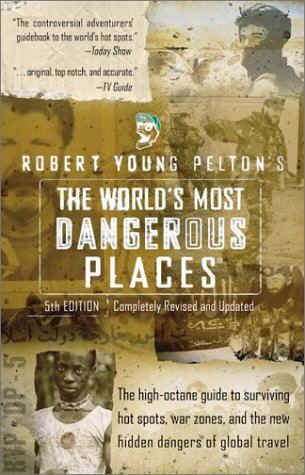 Robert Pelton wrote “The Worlds Most Dangerous Places” and I have read three of them. They are what motivated me to explore places that are “off the beaten path”….He is a motivated writer that will travel to places that most wouldn’t venture. He didn’t specifically mention Serbia but I remember his chapter on Bosnia. He did discuss the Serbs and it planted a seed in my brain that was hard to remove. 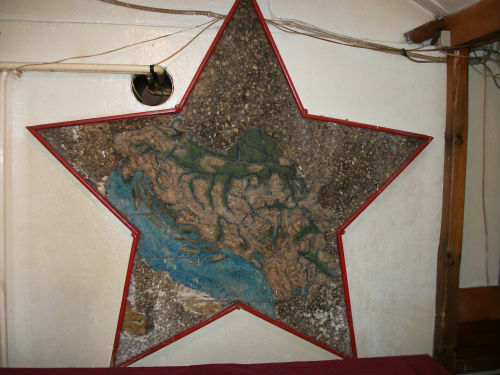 …If you would have asked me before I traveled to Serbia… what the first words that came to my mind when I heard the word Serb it would have been “BIG, STRONG and MEAN.” It isn’t surprising but its very sad! This book was probably my first recollection of hearing something about Serbs… Then in 1999 President Bill Clinton come on tv tell us about the “horrendous acts” that the Serbs were inflicting on others. 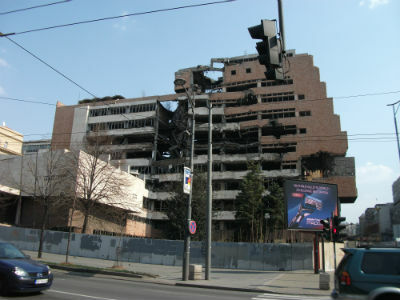 http://www.youtube.com/watch?v=JBKGjMB6Uwk We also had the HUGE influx of Hollywood movies that had a HUGE ANTI-Serb slant…. so you can imagine my thoughts and fears when I realized I was going to be arriving in Belgrade for a two day holiday and it just happened to fall on March 24, 2012 . That is a date that every Serb will always remember. It is the day that NATO started “Merciful Angel.” It led to the three month bombing campaign and the loss of many lives and untold billions in damages to infrastructure! I had received a death threat a few days earlier from some nutcase so I was a little on edge. 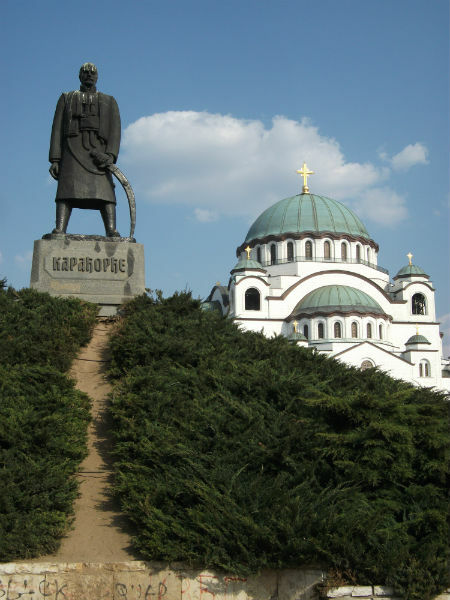 I had been to Belgrade on a few occasions but never had two FULL DAYS to explore. I jumped on the bus in Zrenjanin at 8:55AM on a beautiful Saturday morning. It is amazing how timely and clean the buses are. If you have ever ridden Greyhound in the USA you know what I am talking about! 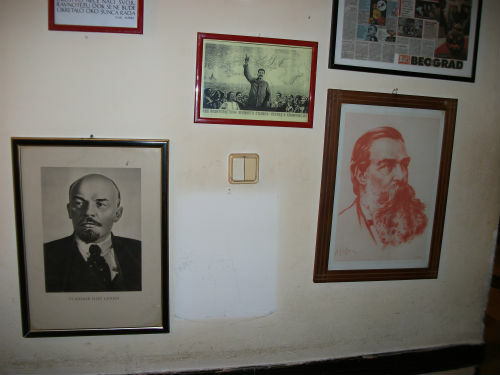 They pulled away from the station and arrived in Belgrade in a little over an hour… exactly as scheduled!!! My buddy, Rade, is a Kosovo Serbian that is studying in Belgrade. He was going to show me the sites and would arrive 20 min to pick me up. The first place I headed was McDonalds! hahaha.. I know, I know…. TYPICAL AMERICAN! They had a McDonalds in Zrenjanin but it shut down a few years back. I had to get my fill! I ordered a Big Mac meal, french fries and coke. It was around 400 Dinars or close to $6. If I remember correctly … its about the same or a little cheaper in state of Illinois. The cashier was a beautiful little brunette girl. I asked her if she spoke English and she said ” Yes, I do” I told her what I wanted and she asked me where I was from. I told her and then complimented her on her PERFECT English. She smiled from ear to ear and thanked me. I could tell that the compliment made her day. She was whispering to the other employees and smiling. 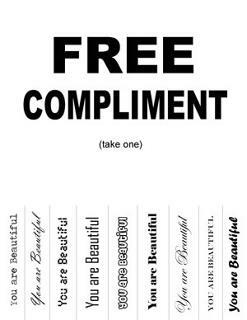 It feels good to make a strangers day by throwing them a compliment. Everyone should try it. A little white lie won’t hurt anyone and it can really make someones day! ;)…. I finished my meal and my buddy showed up to greet me. Him and I have been Facebook buddies for many, many months and it was great to finally place a face with a voice. We have very different political views and beliefs on many things but he is a great friend. We decided we would stop at a little cafe for a coffee. 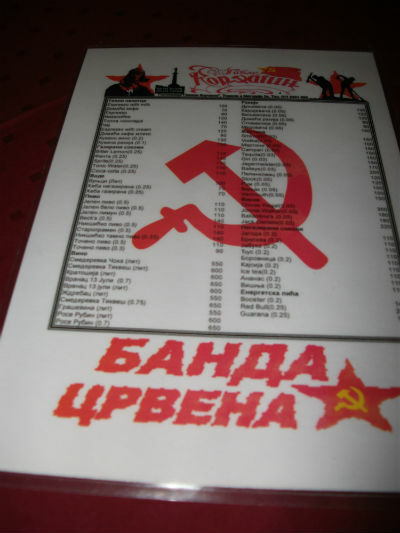 The social aspect of coffee in Serbia is very important. It is VERY rare to see someone ordering a coffee to go. 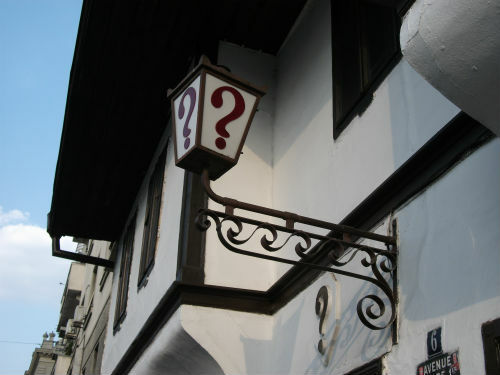 We sat at a little cafe in the heart of the shopping district or Knez Mihailova Street. We sat and argued many subjects. There is nothing wrong with having friends that you don’t agree with on every subject! It makes it more exciting. 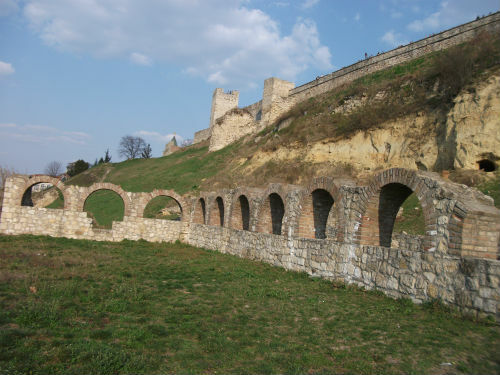 We decided to go to Kalemegdon fortress first. The walk there was fantastic. You see so many people out enjoying the day, street musicians, street artists, puppet shows and kids trying to sell you these little cards to help the poor kids. It is really a great place to sit and watch the crowds. I heard a guy speaking in an American accent. I asked him where he was from. He said “I am from Sweden but learned the American accent because I didn’t like the British!” haha..http://www.youtube.com/watch?v=c3Xi-7orutI We continued on. The street has an ENORMOUS amount of people. The women in Serbia dress like they are attending the wedding of a queen. They have small salaries but always dress VERY WELL! We get to the fortress and my buddy explains some of the history and walks me all over it! It was stunning. It is a great feeling to walk over this ancient structure and imagine all the battles and history it has to offer. We found two little caves that were cut out in the lower walls of the fortress. We walked over to get a closer look and found some belongings from a homeless man and a make shift bed. hahahaha.. 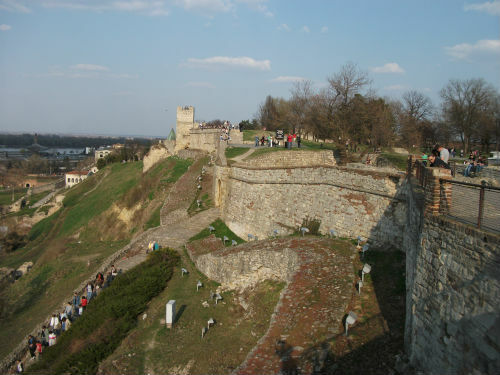 The fortress is massive and covers a large area. The area serves as the central park and contains a restaurant, a couple bars, tennis court, military museum, basketball courts and statue of Pobednik and great views of the two rivers… the Sava and Danube! St Sava is a MONSTER!!! This GORGEOUS church has been under construction since the 1930s! The exterior is close to being completed but the interior still has work to be done. The ground floor covers over 30,000 sq ft. This should be one of the WONDERS OF THE WORLD! 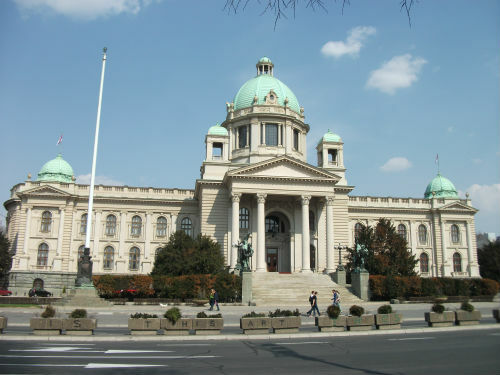 It sits in a little park with fountains, benches, grass and flowers and a statue of Karadjordjevic …the guy who led the first uprising against the Ottoman Turks… Sitting beside the temple is a little church where they conduct services. It is TINY in comparison but filled with some of the most exquisite murals you will ever see! We walk up to the entrance of St Sava. The doors are MASSIVE in size and when you enter the temperature drops about 20 degrees! The cold chill and enormity of the building is truly shocking!!! There is a little gift shop inside the entrance and a place to purchase candles. They light candles for the living and for the dead. My friend explained that there are two different trays to put your candle in. The top for the living and bottom for the dead. This temple only had the top tray because they are still under construction! They have some amazing portraits of their many saints inside. 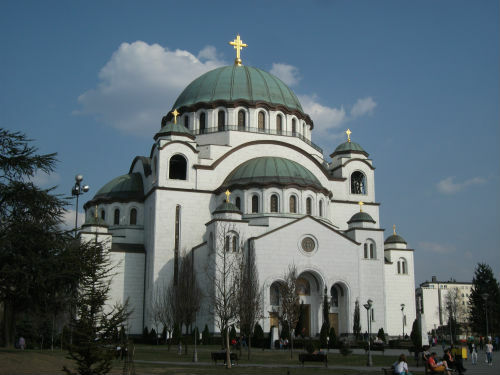 No trip to Belgrade would be complete without a visit to St Sava! It will be ingrained in your memory for a lifetime!!! 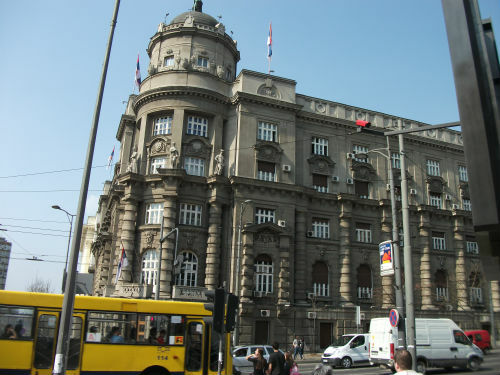 Next up…..finding a place to stay….. On my previous stay in Belgrade… I stayed at my first hostel.. I met some great guys from Iraq and decided to try that hostel again. It is the Chillton Hostel that is located across from KFC! http://www.chilltonhostel.com/ Very close to the center, clean, friendly and the staff speak perfect English! It is very cheap at 13E a night. While I was checking in, we met a guy from Spain, Australia and a Serbian muslim from Novi Pazar. My two serbian buddies were with me and we invited the three guys to go for a pivo.. We went to a little bar that was below the bookstore. We drank many beers and had a great time. 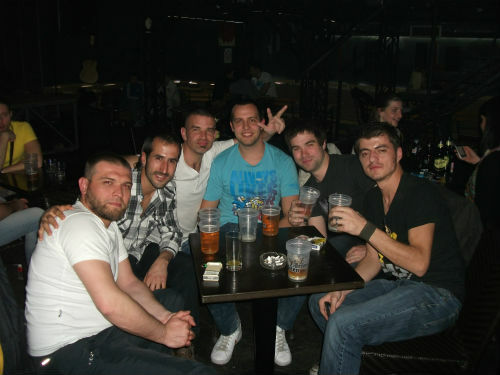 If you ever need a cheap place in Belgrade and like to socialize with other foreingers…. CHILLTON HOSTEL ROCKS! 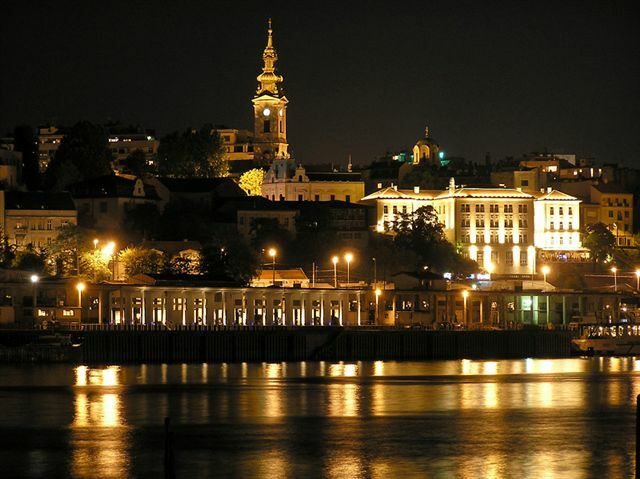 Belgrade has so much beauty, history, nightlife, annual festivals, great food and hundreds of excellent little cafes and bars! It is also very cheap in comparison to Rome, Paris, London, Sydney etc…. The people are friendlier too!!!! GIVE BELGRADE A SHOT!!! You won’t want to leave!!! hey there… thanks a million.. i should take more time to get the correct spelling and such but it takes me soooo long.. i appreciate the info.. take it easy, my friend and thanks for reading! WordPress has spell check… and grammar check. great article. hmm I should visit that city. heck yeah!!! come over!!! where are you from? thanks a million, Dimitrije… i really appreciate you reading it!!! awesome… tell him to add me on Facebook… i forgot he was still there!!! Cool read indeed, I will be there on the 29th of Feb. Booked my trip just bc this article. Thanks for this.